When it comes to playing men burdened with the weight of the world on their shoulders, few are better than David Oyelowo, just look at his emotional performances in Selma and HBO's Nightingale for examples. Now he takes on another such role in the drama, Five Nights in Maine, which sees him paired up with Oscar winner, Dianne Wiest in what looks to be a powerful combination. 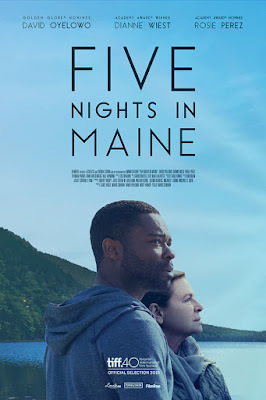 Written and directed by Maris Curran, the film stars Oyelowo as a husband grieving over the death of his wife, with whom he left many important things unsaid. Wiest plays his mother-in-law who invites him up to Maine to hash out their many differences, not the least of which is how they are coping with the loss. Also starring Rosie Perez and Teyonah Parris, Five Nights in Maine hits theaters and VOD on August 5th.